This form is drafted for use when a tenant will take additional space that is currently occupied by another tenant. The amendment documents the expansion of the tenant's premises, and specifies the other terms and conditions of the expanded lease. THIS FIRST AMENDMENT TO LEASE ("Amendment") is made as of _________________, 20__, by and between COMMERCIAL PROPERTY LANDLORD, a ______________ limited liability company ("Landlord"), and ACCEPTABLE TENANT, INC., a ___________ corporation ("Tenant"). A. Landlord and Tenant entered into a Lease Agreement dated _________, 199_ (the "Lease") by which Landlord leased to Tenant and Tenant leased from Landlord Suite ___ (the "Existing Premises") containing approximately ________ rentable square feet of office space on the ___ floor of the building known as _______ Office Park located at _____________ (the "Building"). B. The Term of the Lease is scheduled to expire __________, 200_ (the "Expiration Date"). C. Landlord and Tenant desire to amend the Lease to (i) provide for Tenant to lease Suite ___ (the "Additional Space") containing approximately _____ rentable square feet of office space on the 2nd floor of the Building; and (ii) make certain other changes in the Lease, all upon and subject to the terms and conditions set forth in this Amendment. The approximate configuration and location of the Additional Space is shown on Exhibit A. 1. Capitalized Terms. Capitalized terms not otherwise defined in this Amendment shall have the meaning given them in the Lease. 2. Leasing of Additional Space. 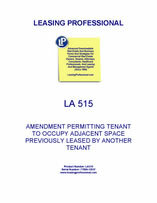 Landlord leases to Tenant and Tenant leases from Landlord the Additional Space for a term commencing the earlier the date Landlord delivers possession of the Additional Space to Tenant following the date Landlord obtains possession of the Additional Space from the Existing Tenant (as hereinafter defined), or (b) __________, 200_ (the "Additional Space Commencement Date"), and unless sooner terminated, expiring on the Expiration Date. 3. Existing Tenant. Tenant acknowledges and agrees that the Additional Space is leased and occupied by an existing tenant (the "Existing Tenant") in accordance with a lease which expires ___________, 200_. Landlord agrees to use good faith efforts to regain possession of the Additional Space from the Existing Tenant and to deliver possession of the Additional Space to Tenant following expiration of the lease with the Existing Tenant. Landlord shall not be liable for any claims, damages or liabilities if Landlord is unable to deliver possession of the Additional Space to Tenant following expiration of the lease with the Existing Tenant. 4. Premises. Following the Additional Space Commencement Date. Commencing on the Additional Space Commencement Date and continuing through the Expiration Date, except as a provision herein applies only to the Additional Space, the Additional Space shall be included in the "Premises" for all purposes under the Lease (and the "Premises" shall consist of both the Existing Premises and the Additional Space, totaling approximately _________ rentable square feet of office space).